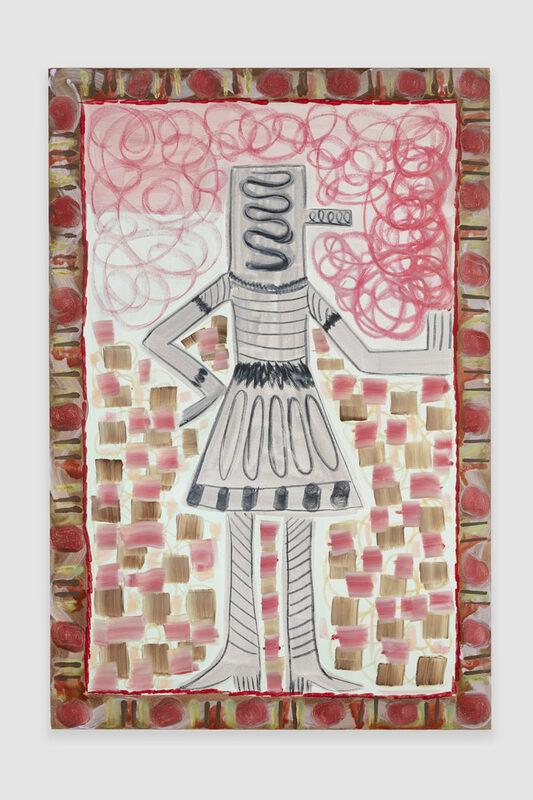 Klaus von Nichtssagend Gallery is pleased to present a show of new works by Tamara Gonzales, opening May 10th. This is the artist’s third solo show with the gallery. The title Bo Yancon, is the nickname given to her by indigenous Shipibo people of Peru, and translates to “green hair” in their native language. Bo Yancon alludes not only to the artist herself, but also to the femininity of the figures in her recent paintings. Tamara Gonzales travels to Peru often, and her experiences and friendships there have become a source of inspiration in her work. Patterns are a recurring feature of Shipibo artwork, and each arrangement is loaded with significance and meaning. On a recent trip, a maestra named Olga sang an Icaro healing song to Gonzales, using the patterning in a handmade bracelet as a musical score. Channeling her time in Peru and her Shipibo influences while working in her studio in Brooklyn and upstate New York, Gonzales develops her own painted patterned motifs. In her newest work, these gestural forms are created by using a paintbrush, rather than the spraypaint and lace stencils she has used in the past. This brings the artist’s hand and drawing-like mark into the foreground, resulting in a wonderful mixture of washes and calligraphic line used on each canvas. A character painted in greyscale fills the center of each canvas, positioned as if posing or stretching. The limbs of each figure extend to cordon off plots of space and contrasting color in the background. Each painting has an outer border, similar to tapestry and fabric compositions, which defines an area that the female figures push against. The personalities of Gonzales’s characters derive from their stances as well as surrounding ornamentation, evoking the narratives embedded in patterned Shipibo embroidery. Tamara Gonzales was born in Madera, California and currently lives and works in Brooklyn, New York. Her work has been written about in the New Yorker, The Brooklyn Rail, and ArtNews. Recently her work was shown at The Pit in Los Angeles, Venus Over Manhattan in New York (curated by Peter & Sally Saul), the New York Studio School, and the High Museum of Art, Atlanta. Public collections containing her work include the High Museum of Art, Atlanta, GA, the Bronx Museum of Art, and Bowdoin College and Colby College Museums of Art, ME.